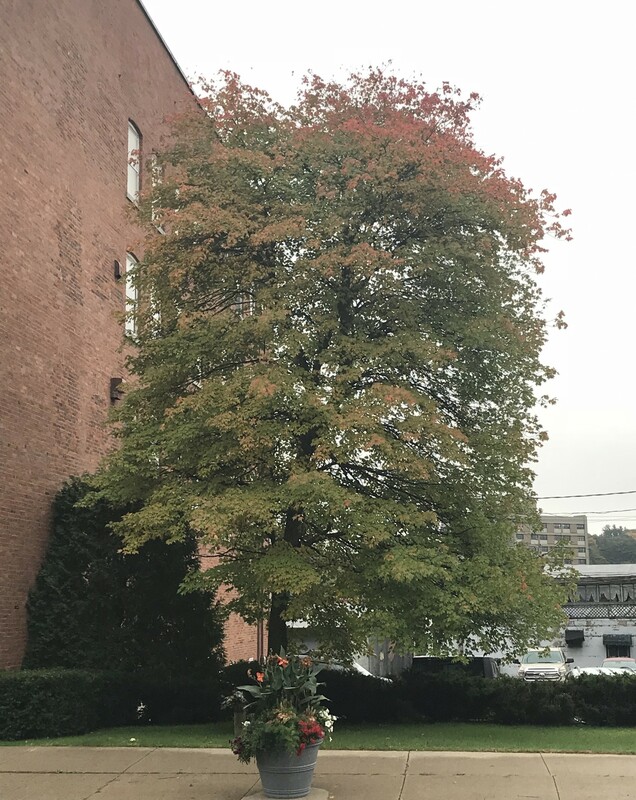 I LOVE NY started the “New York Fall Foliage Report” on September 12 and will continue until the end of the foliage season, around the first or second week in November. 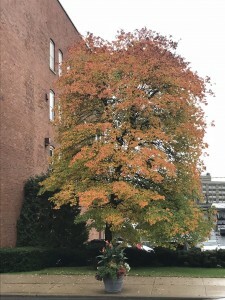 Fulton County has its own “foliage spotters” to participate in this annual report. 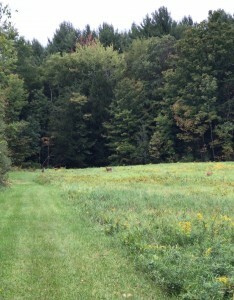 Some areas are still predominantly green with areas nearing peak. With the warm weather turning to cooler temperatures with rain, trees are starting to lose their leaves in some locations as well. This weekend into next week would be a good time to take a fall foliage ride. This weekend is full of fun! The Colonial Little Theatre presents “Dial M for Murder” on two weekends: October 12-14 & 19-21. This production tells the story of Tony Wendice and his wealthy wife, Margot, who now plans to murder. He arranges the perfect murder and blackmails a scoundrel he used to know. Unfortunately…the murderer gets murdered and the victim survives. But this doesn’t baffle the husband as he plots to have his wife convicted for the murder. Until a police inspector and a young man discover the truth. Gloversville’s annual Fallfest will be on Saturday, October 13 from 12-4pm at Trail Station Park across from the Transit Facility. There will be pumpkin painting, bounce houses, face painting, potato sack races, three-legged races, hula hoop contest, egg races, music, vendors and more. Food will be available for purchase. The day will conclude with a children’s Halloween costume parade and trick or treating through the park at 4pm. Come and enjoy the colors of autumn and the many events Fulton County has to offer. Call for Travel Guides and Specialty Maps! 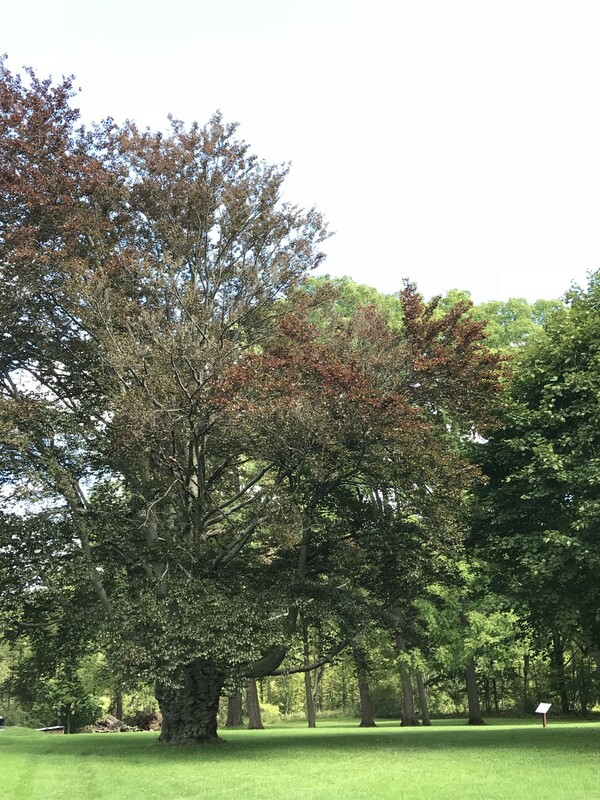 The leaves are nearing the midpoint with more color showing this week in some locations and still predominantly green in other spots. 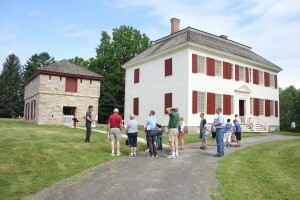 Visit Johnson Hall State Historic Site this weekend for the New York State Path Through History weekend. “Hunting and Harvesting; Preparing for Winter in the 18th Century” will take visitors on a journey back to the 18th century to experience what it was like to hunt, harvest and preserve enough food to last the cold and harsh winters. 18th century hunting and harvesting equipment will be on display as interpreters provide a firsthand look at the tools and labor required to achieve the task. Despite all the preparation, equipment and labor, each winter brought the same unnerving question for some: will there be enough food to last until spring? The event runs Saturday, October 6 from 11am-4pm and admission is $4.00 Adults, $3.00 Senior Citizens and Students, Children 12 and under Free. 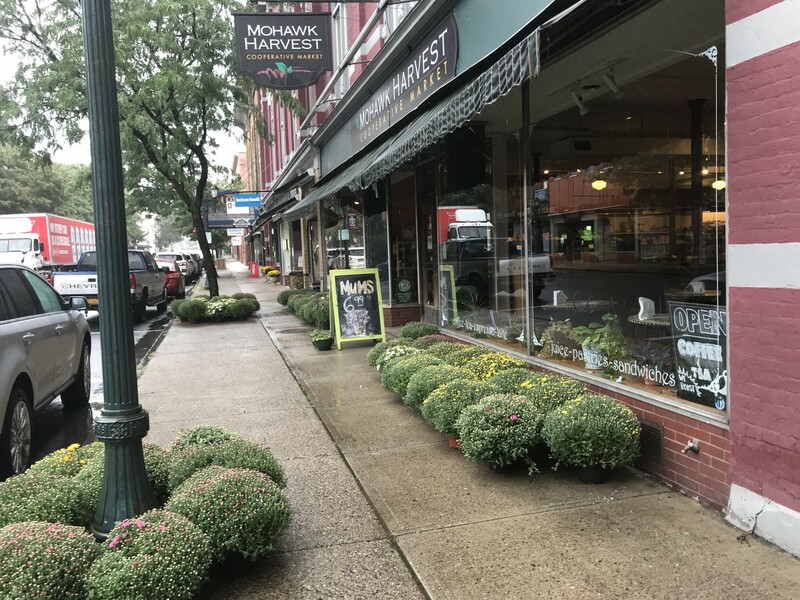 On Sunday, October 7, the Sacandaga Valley Arts Network presents Toby Walker. Internationally and nationally acclaimed Toby Walker has been hailed as an award winning, roots music fingerstyle guitar virtuoso and songwriter who has toured the US, the United Kingdom, and all through Europe. Blending the styles of blues, ragtime, country, bluegrass, old-time jazz and rock, Walker has a style of his own and as such received numerous awards, including being the 1st place recipient of the International Blues Challenge Award in Memphis and the NY Music Award for best instrumental CD. Walker has also been inducted into the NY Blues Hall Of Fame. I LOVE NY starts the “New York Fall Foliage Report” on September 12 and will continue until the end of the foliage season, around the first or second week in November. 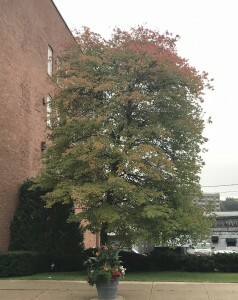 Fulton County has its own “foliage spotters” to participate in this annual report. Coming up this weekend is the on Saturday, September 29th, The Harvester Cycling Tour at the Johnson Hall State Historic Site. Fulton County Day On The Farm is on Sunday, September 30th, 12:00 PM – 04:00 PM at Roger’s Family Orchards in Johnstown. This marks the 9th annual “Fulton County’s Day at the Farm” agricultural festival. Support the agricultural community and join your friends and neighbors at the farm. The leaves are just beginning to change with a lot of green and hints of yellow and patches of orange sporadically throughout. 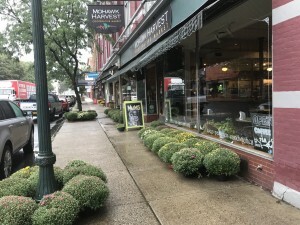 Other signs of the fall season are popping up as well with farm having apple picking and mums and apple cider for sale. This weekend features an array of events from live music to vendor festivals. The 24th annual Eagle Mills Art and Craft Show kicks off on Saturday for two great weekends! 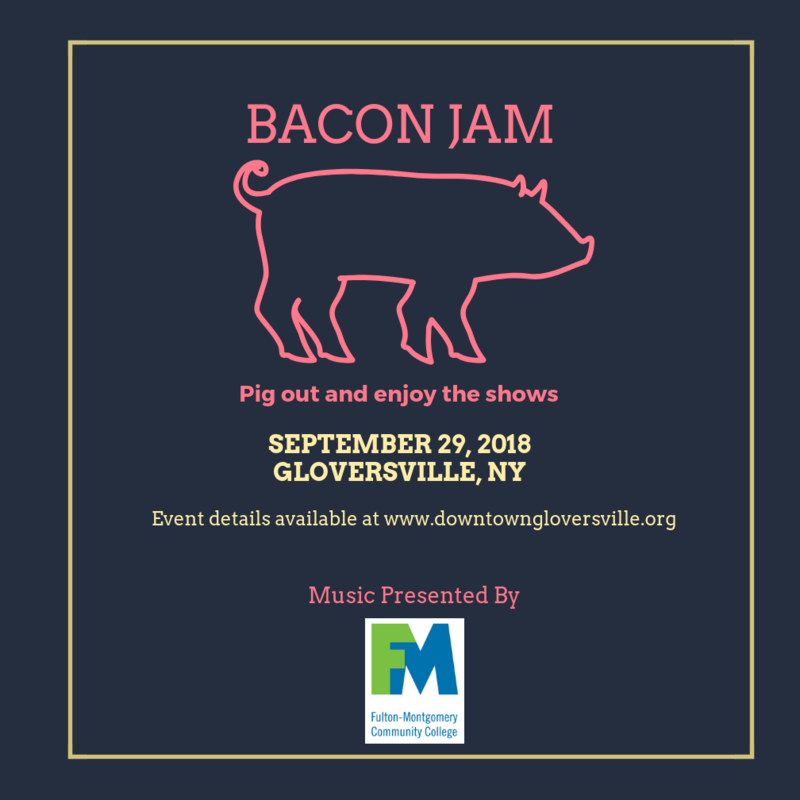 Join your friends, family and neighbors on Saturday, September 29th from 4 p.m. to 8 p.m. at the Farmers Market Pavilion between Elm and Bleecker Streets in Gloversville for a day full of bacon and music. 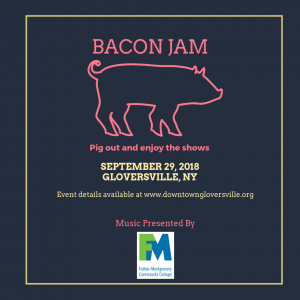 Bacon Jam is a bacon and music festival open to everyone! Entry is free to the event. Area food vendors will be on-hand featuring bacon-centric food. Stop by and listen to live, local bands. A beer garden will also be available for a $5 entrance fee with beers sold by the glass from local breweries including Stump City Brewing, RS Taylor & Sons, and Nine Pin Cider. Thank you to our music sponsor: Fulton Montgomery Community College. Full details on the event are available at www.downtowngloversville.org. Questions? Call us at 518.725.7700 ext. 1004. Tickets are still available for the 1st annual Chocolate and Dessert Concert, benefiting the Friends of Johnson Hall beginning at 6:30pm on Saturday, September 22 at the Johnson Hall State Historic Site. This fundraising event will support the ongoing historic restoration of Sir William Johnson and Molly Brant’s 18th century estate. A variety of 18th century hot chocolate drinks will be made and served by Paul Supley of Van Wyck Chocolate House. Culinary historian Sara Evenson will provide fresh-baked Pippin pies and biscuits with crabapple jelly. Following the chocolate and dessert, a concert of 18th century music will be held in the Hall’s center hallway by Liaison Plaisantes. While tickets are still available, the event is limited to 40 participants. Pre-registration and pre-payment of $25 is required, payable to the Friends of Johnson Hall. 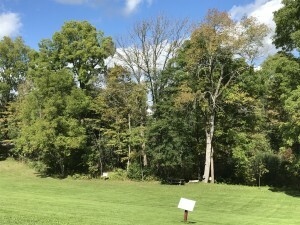 The Friends of Johnson Hall is a not-for-profit organization which supports the educational programming and ongoing historic restoration of Johnson Hall. To make reservations and for more information, call (518)762-8712. Johnson Hall was the 1763 Georgian-style estate of Sir William Johnson and Molly Brant and their family. Sir William (1715 – 1774) was the largest landowner and most influential individual in the colonial Mohawk Valley. His success in dealing with the Six Nations had a lasting impact on their relationship with the English, and largely influenced England’s victory in its struggle with the French for control of colonial North America. The main house and flanking stone houses, originally surrounded by a 700 acre farm, now interpret the Johnson family through guided tours of the period room settings, educational programs and special events.